Yep. Just when you thought you could remember the entire starting line-up. The summertime transfers are set to begin. That means a bunch of new faces moving in, and a few stale old ones moving out. Welcome Michael Thomas. And I guess we can say the same for Steven Caldwell, who has just signed for a three season hitch. Sayonara… tbd. Our first halfies have had a tough go of it. There’s’ still hope that the second halfies will do better. With the shuffle starting for real in the coming days. TFC are in a weird limbo. Poised to shake and bake the roster, but not yet holding all their chickens. Wow – stunningly greasy metaphor. And L’Impact du Montreal saunter into town tonight. The Eastern Conference leaders and first half dominators are feeling pinchy in their Gucci loafers this week. Last weekend’s game with the Rapids saw them drop a rare home loss to the tune of four goals allowed. It probably didn’t help that Italia fizzled to third in the Confederations Cup. 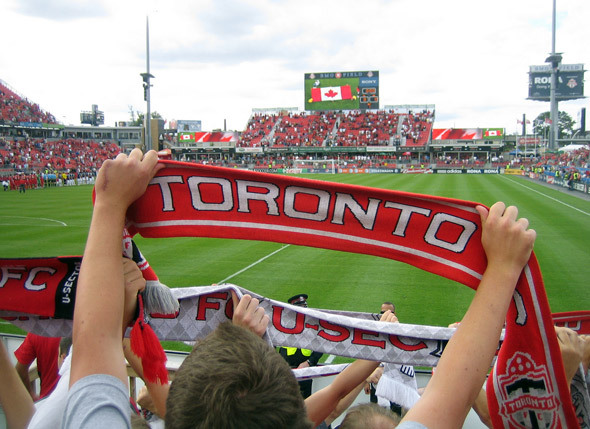 After the 6-0 beat-down they put on TFC in their last contest, both sides are certain to be spirited tonight. What more can one ask of a mid-week, night game?!! Love it. The Reds improved defense will have to stand fast. The attack, however, has to show up in a form we haven’t seen for weeks. With or without Earnshaw, TFC now have enough attacking options to try a few variations going forward. Service into the box needs to be better. Too many good attacks are fizzling out while TFC leaves bodies forward looking for the cross. Frankly, it isn’t that surprising that Richter is having a tough time. Darren O’Dea has a good left foot, and it would be nice to see more of it putting the ball into attackers in the box. Most importantly, the Reds need someone to finish. The RSL game over the weekend, proved they could hold off a strong opponent. It also demonstrated their current woes when it comes to converting chances into goals. Danny Koevermans looked less than sharp in his first start of 2013. All will be forgiven, of course, once he starts potting goals again. The Impact are 3-2-0 in the last five and always dangerous. Lately, they’ve looked a bit more vulnerable. On our side, the Impact have never won at BMO Field. Tonight, it’s up to the Reds to bring it.